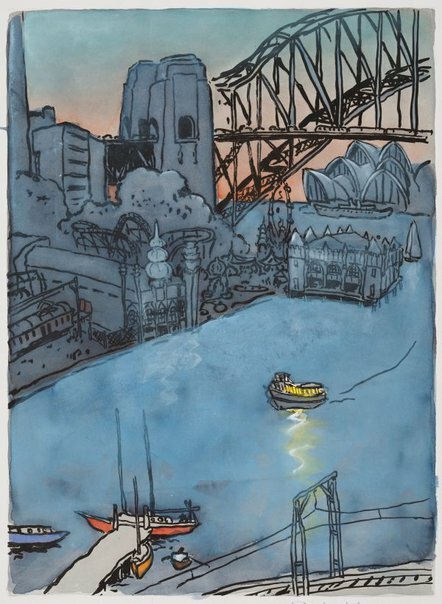 This print was commissioned and used by The Sydney Morning Herald for the early/country edition of that newspaper on New Year's Day, 2003. It is a classic view of Sydney Harbour from Lavender Bay showing the Bridge, Opera House, Luna Park, the railway depot and a Hegarty's ferry at dawn. Signed l.r., pencil "Peter Kingston". Not dated. Look , Sydney, Feb 2009, 41 (colour illus.). NOTE: Featured in the Members events March 09 section. Gavin Wilson, Harbourlife , 'harbourlife', pg. 7-32, Sydney, 2007, 57, 26.